Blood stream invasion and dissemination of Pseudomonas from local sites of infection is probably mediated by the same cell-associated and extracellular products responsible for the localized disease, although it is not entirely clear how the bacterium produces systemic illness. P. aeruginosa is resistant to phagocytosis and the serum bactericidal response due to its mucoid capsule and possibly LPS. The proteases inactivate complement, cleave IgG antibodies, and inactivate IFN, TNF and probably other cytokines. The Lipid A moiety of Pseudomonas LPS (endotoxin) mediates the usual pathologic aspects of Gram-negative septicemia, e.g. fever, hypotension, intravascular coagulation, etc. It is also assumed that Pseudomonas Exotoxin A exerts some pathologic activity during the dissemination stage (see below). Pseudomonas aeruginosa produces two extracellular protein toxins, Exoenzyme S and Exotoxin A. Exoenzyme S has the characteristic subunit structure of the A-component of a bacterial toxin, and it has ADP-ribosylating activity (for a variety of eucaryotic proteins) characteristic of many bacterial exotoxins. Exoenzyme S is produced by bacteria growing in burned tissue and may be detected in the blood before the bacteria are. 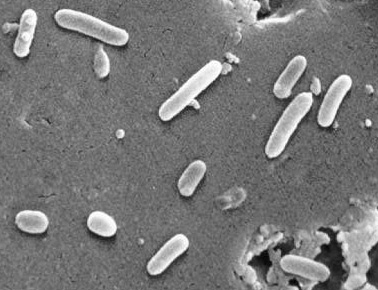 It has led to the suggestion that exoenzyme S may act to impair the function of phagocytic cells in the bloodstream and internal organs as a preparation for invasion by P. aeruginosa. Exotoxin A has exactly the same mechanism of action as the diphtheria toxin; it causes the ADP ribosylation of eucaryotic elongation factor 2 resulting in inhibition of protein synthesis in the affected cell. Although it is partially-identical to diphtheria toxin, it is antigenically-distinct. It utilizes a different receptor on host cells than diphtheria toxin, but otherwise it enters cells in the same manner and has the exact enzymatic mechanism. The production of Exotoxin A is regulated by exogenous iron, but the details of the regulatory process are distinctly different in C. diphtheriae and P. aeruginosa. Exotoxin A appears to mediate both local and systemic disease processes caused by Pseudomonas aeruginosa. It has necrotizing activity at the site of bacterial colonization and is thereby thought to contribute to the colonization process. Toxinogenic strains cause a more virulent form of pneumonia than nontoxinogenic strains. In terms of its systemic role in virulence, purified Exotoxin A is highly lethal for animals including primates. Indirect evidence involving the role of exotoxin A in disease is seen in the increased chance of survival in patients with Pseudomonas septicemia that is correlated with the titer of anti-exotoxin A antibodies in the serum. Also, tox- mutants show a reduced virulence in some models. Table 1 (below) is a summary of the virulence determinants of Pseudomonas aeruginosa. Table 2 (next page) is a brief description of the diseases caused by Pseudomonas aeruginosa.